A few years ago, as I was interviewing Shelby Lee Adams for this blog, he suggested I get my hands on a copy of this book. I'm glad I did. Published in 1979 by a group calling themselves the Mountain Photography Workshop, it's a result of work created by seven photographers: Lyn Adams, Shelby Lee Adams, Robert Cooper, Earl Dotter, Will Endres, Wendy Ewald, and Linda Mansberger. 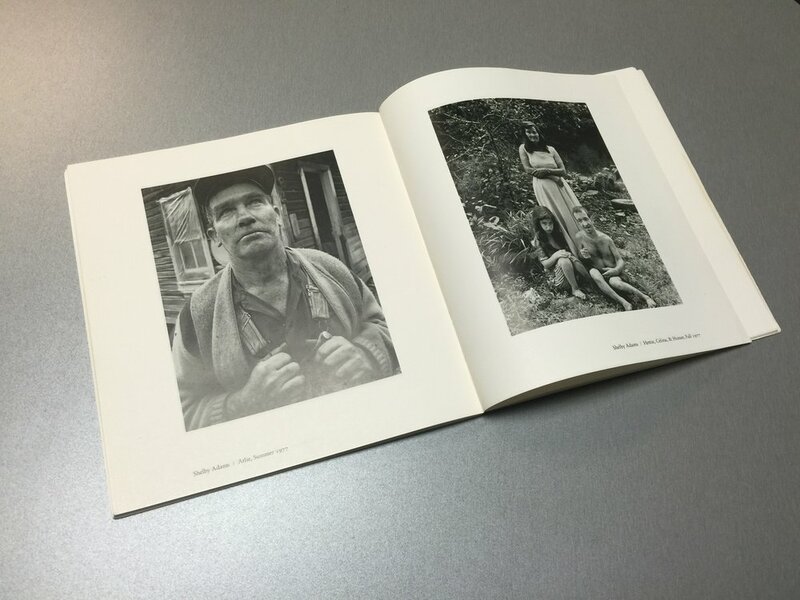 In 1976, the group was awarded a National Endowment for the Arts grant to document West Virginia and Kentucky's Appalachian regions. Since buying this book, I can't tell you how many times I've thought about doing something similar with a small group of photographers. Ewald writes, "Each photographer chose one subject to document. We met every two months to talk about the work we had done. At the end of the year, as a group we began to edit the photographs and decide how best they could be used. We felt it was more important for each of us to look in depth at an aspect of the culture we were most concerned with rather than to document the region overall. This book is a result of our work together for a year and a half. It is a personal view of a people and a landscape, which has nurtured us as photographers and individuals." The book begins with a foreword by Robert Coles, which I can't seem to escape. I mean that as a good thing. Coles' influence on many of the documentarians I admire so much is everywhere and I was glad to find it here as well. We're then treated to a lengthy forward by Loyal Jones, which if you aren't familiar with, please stop reading this now and go familiarize yourself with him. Do it. As with most of the Appalachia themed books I've acquired over the years, I bought this one used. There's something I admire, prefer even, in the worn cover, the imperfect pages, and stray marks here and there. I believe I bought my copy for around $10 online, but I've seen a "collectible" copy listed for $400. This is a book that was created to be handled, to be studied, and used. I'd like to think it honors both the people and places photographed as well as those who made the pictures to be used as such. Most of the book is devoid of text with the exception of caption information. When text is present however, it is pleasantly arranged in the voice of the person being photographed. We're brought in to glimpse the lives of Rena Meade (by Wendy Ewald) and C.F. "Catfish" Gray (by Will Endres) in near first-person accounts, which is really something wonderful. As I've said before, I'm a fan of text when it is done well or with purpose, but I don't always believe it's necessary. In these two cases, it adds a great deal to the images to better inform us of who we're looking at and learning about. There seems to be an air of faithfulness to these images, which I think is challenging when you consider the total number of photographers involved. Two or three photographers, sure. But when you more than double that number (again, seven total), faithfulness and its pursuit can be diluted, subject to ego, arrogance, and self-centeredness. I find this collection remarkably absent of such pitfalls. In Loyal Jones' foreword, A Remembrance, he shares, "John Campbell wrote that more is known that isn't so about this place and people than any other on the globe. Perhaps so. The old stereotypes and supposed facts are pervasive. Almost everyone has an opinion of this place, whether or not he has any firsthand knowledge. How does one describe this place and its people? It depends on who is doing the looking and his assumptions, attitudes, and cultural baggage. It depends on the relationship between the looker and the looked-at, the photographer and the photographed, the recorder and the recorded. In the end we who are part of the region and who try to describe it can only report what we have seen, what has happened to us and what we have come to believe. When we compare our pictures, we know that the same land and people are different to each of us. So it is everywhere." This is another book I highly recommend. Given its affordability and availability, it would be a shame to not have a copy and to sit with it for a while. I've included a few spreads here and some brief notes about the photographers who made them. *Editor's note: The photographer's notes listed below are verbatim from the book, which was published in 1979 and are not current in reference to where the photographers are now. *Earl Dotter's major work as a photographer in Appalachia has primarily focused on coal miners and their communities. From 1973 to 1977 he was the photographer for the United Mine Workers Journal. His work focuses on the workplace, health, and safety of Appalachian coal miners. *Shelby Adams was born and raised in Letcher County, Kentucky. In 1968, he left to go to art school. He now lives in Cincinnati, but makes frequent trips back to visit his family and the two families he has photographed. He has take pictures of the Caudill family for four years and the Childers family for two years. He works with a 4x5 view camera and uses Polaroid film to let his subjects share in the excitement of making the images. *Robert Cooper began to photograph the area around his hometown, Sutton, West Virginia in 1966. In a way he photographs his autobiography by his evolving relation with his hometown and the surrounding area. He was worked on a photographic essay of Central West Virginia for several years and continues to work there now as a photographer-in-residence for the Arts and Humanities Council in Braxton County. *Wendy Ewald moved to Letcher County, Kentucky in 1975. Soon after, she began photographing Rena Meade, who lives in Cowan, a neighboring community. Wendy portrays Rena's life, her relationships with the land and her family, and her passage through life's most difficult transition - the death of her husband of 40 years.